I love sneaking health and nutrients into refreshing, sweet, and dessert-like smoothies. As my sister says, “I feel like I’m indulging in something I should feel guilty about.” Smoothies can fool the pickiest of eaters… yes, I’m even talking about your 3 year old who will only eat chicken nuggets. 1) You must… uh hmm… must have a quality blender! I, myself, am a Vitamix girl. I know they’re a little pricey, but worth every. single. penny. Here’s a post on why I decided on a Vitamix. If you’re not ready to take the plunge on a Vitamix, others have had success with either a Ninja or a BlendTec. Whichever you choose, I promise it will be used daily. I’ve made baby food, puree soups, ground wheat and other grains, and of course made rockin’ smoothie recipes. Your health is worth investing in a quality blender! 2) Your vegetables and fruits pass through lots of hands, dirt, pesticides, and other contaminates before reaching your lovely home. Wash your vegetables! I don’t mean rinse under water. I mean scrub those bad boys. It takes 10 extra seconds and removes lots of nasty stuff from your fruits and veggies. I have tried numerous of vegetable washes and keep coming back to Fit: Fruit and Vegetable Wash. Here’s a post on why you should wash your vegetables. 3) Sneak at least one vegetable into every smoothie. You can play around with different vegetable and fruit combinations. If it’s too sweet, add another vegetable. If it’s not sweet enough, add more fruit or frozen fruit. 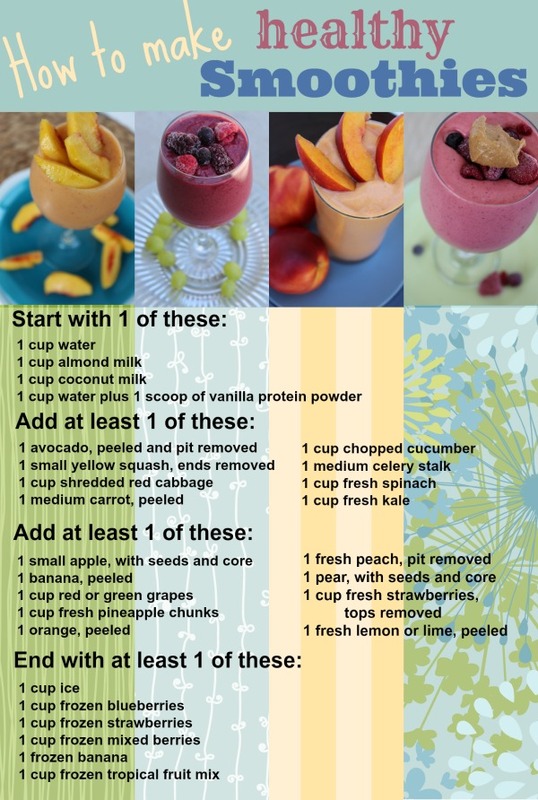 You can tweak and have fun in creating your own healthy smoothie. Here’s a quick guide on how to make healthy smoothies. 4) If you can afford organic, purchase only organic fruits and vegetables. I started tasting the chemicals absorbed into regular produce. Especially with carrots and apples, purchase organic. 5) My most popular smoothies are my Jamba Juice Copycats. They are 4 ingredients or less and super creamy. You’ll regret passing up my Mango A-Go-Go, Caribbean Passion, Peanut Butter Moo’d, and Razzmatazz smoothies. ****Update**** I have had numerous comments, questions, and concerns regarding apple seeds and their safety. The seeds contain a controversial compound called vitamin B17. Apple seeds are a good source of potassium, magnesium, and are high in protein according to the “International Journal of Food Sciences and Nutrition”. Some research show apple seeds may treat and prevent cancer. However, you should not eat a large amount (like a cup full) of apple seeds at one time. The compound amygdalin (vitamin B17) is a potentially toxic cyanide-containing molecule if too many apple seeds are eaten. There are usually only 3 to 5 apple seeds per apple. To see any toxicity, you would need to eat about 24 apples worth of apple seeds at one time. Signs of toxicity to this compound include headache, nausea, fatigue and lethargy. However, apple seed toxicity is very rare. With this information, please make the best decision regarding whether or not to include the apple seeds in your smoothies. Like I said, apple seeds are very controversial. Thanks for the great information. I’ve been so excited for warmer weather to bring the smoothies back at our house and your mix and match recipe format makes it so easy! When I start gaining weight I’m fatigued and unmotivated. That’s when I know it’s time to start getting active and choose what goes in my mouth more wisely. Right now my husband and I are both trying to eat better so it’s great to have the accountability. I LOVE this! What a simple way to combine ingredients. I’m always trying to think of new smoothie concoctions, and this helps a ton!! Thanks! I am actually so happy to follow everyone I Facebook and pinterest! I was already following you but I always love more tips/recipes/idea!! THANKS! Great giveaway! I have definitely been hearing that a good blender is worth it! What a great post! I recently started drinking green smoothies and I love them! Why are you motivated to get or stay healthy? To be able to be a better mom and wife! This is great! Smoothies are good anytime of the day! I am motivated to get healthy and stay healthy so I feel more confident and have more energy! I would LOVE to win a Blendtec. My mom has one and is obsessed. I’ve been using a Magic Bullet daily for 2+ years and it just broke so I’m back to our old school blender. Definitely need an upgrade. Oops, I commented before I read what you wanted us to comment about 🙂 I’m motivated to stay healthy for baby #2 that’s growing inside me! I follow all of you already! I’m such a smoothie person. My daughter has autism-related sensory issues with food and smoothies and homemade popsicles have been miracles for us! Fingers crossed! Thanks for the smootie list.Makes it easier to do them. My motivation is my family. I want to feel good so I can be my best for them. Great giveaway! Great job on Studio 5 today. Crossing my fingers I can win one to make smoothies for all eight of us. I am so excited to start making these yummy smoothies. Thank you so much for being on KSL 5. I am hoping for a great year in my weight loss journey. I think you are right. A high quality blender is a must. I want to be healthier one for me…I feel better more energy…two for my baby I’m nursing a four month old…and three to set a good example for my kiddos! I hope to win…great segment on studio five today…thanks for making it easier to understand…never have I tried oatmeal in my smoothies…going to try! I want my body back after having my baby! I want to feel better about myself and I know that a diet is not going tofix it I need to change my lifestyle. i am excited to be able to win this so that i can start trying to be healtherier and having a blender that would actually blend stuff would be so helpful! I love sll of the info you have here! Thank you!!! Great job on studio 5. I’m excited to try some new smoothie combos. So sneaky to sneak in those healthy foods:) Oatmeal is so great in a lot of yummy stuff. I want to be healthier for myself, but also for my family. I just had a baby and I really would love to lose the baby weight, make organic baby food when she’s older, and teach her to eat healthy! Thank you! i am motivated to stay healthy so that i can feel better about myself and have a longer like and beable to do the things that i want without being self concious. Being healthy affects how you feel, how you look, and how you interact with others. There are so many aspects to being healthy physically, mentally , emotionally, spiritually, etc. We need to address all aspects of health for an optimum life! I don’t own a powerful blender so it would be great to try out all these smoothie recipes in a new Blendtec! Thanks for the offer! I love eating my veggies in sneaky ways! Have a very picky child who will not eat fruits and veggies. Would love to make the smoothies to sneak some healthy things in there. Lovedyour segment. Having more energy and better health should be the greatest motivator in all our lives. I love making healthy smoothies and trying to create healthy balanced meals. My 6 month old baby is just starting solid foods. As I have been feeding her her meals of squash, or sweet potato I am thinking more about how many fruits and veggies my husband and I are getting. Not enough for sure. We love smoothies, but are getting sick of the same old with a handful of spinach added. Your printable will help change things up. And an upgrade form our $20 blender would allow us so many more possibilities! A quality blender is a must, Tiffany! Thanks for entering and hope you win something fun… well, they’re all fun prizes. I’m motivated to stay healthy for my kids/family! I love how I feel when I make healthy choices! Making healthy choices is motivating because of how good it makes you feel, I think. I saw you on studio 5 mad am excited to now follow your blog! I feel so much better when I eat healthy! I really need a good blender, do it would be awesome to win this one! Why do I want to stay and be healthy….My kids. I feel better, act better, live better. Because I need to keep up with my 4 kids! Thanks for sharing such great information with us. I can’t wait to try some of your recipes. I love your idea of eating healthy and not worrying about a diet!!!! I saw your segment on Studio 5 today and a lot of what you said resinated with me, especially that fact we get to much dairy in our diets. Thank you for sharing your Healthy smoothie recipes with us all. I have been on a quest to be more healthy the past 5 years and have turned around high Blood pressure (off all meds), high blood sugar and lowered my cholesterol all by changing my diet. Thank you, Julie! I’m so proud of all the amazing changes you’ve made. I want to help others see the power of food and how it can solve many health concerns. Thanks for entering. What a great post on smoothies. I have been looking for more recipes and love your giveaways! I would love to win the blender. Smoothies are so yummy. By FB name do you mean user name or name name (so not a techie) ??? Novene, thanks for entering! I mean FB name. The hubs and I LOVE our daily green smoothies! I lost almost 40 lbs last year and plan to keep it off! 🙂 thanks for an amazing giveaway!! Amazing, Melissa! I’m always looking for people willing to share their weight loss success story. If you’re willing, I would love to share it! Please email me if you’re interested. Your spot on Studio 5 today was such a great reminder for me. I know what I should be doing (somewhat) but you compelled me to DO IT ( Of course a Blendtec would be very helpful)! Thank you, Novene! I hope you win it! My family keeps me motivated, as well as feeling good. A great giveaway! I would love to start using a blender to help my family and I eat healthier! I’m trying to love the baby weight and having a Blendtec to make all these yummy healthy smoothies would really help! Such an awesome giveaway!! I want to get healthy for my kids. I want to be a better example to them. I just turned 50, and it is time to get healthy to enjoy life with kids at college! I used to make a smoothie every morning… Same exact one everyday and got tired of it- excited to try these ones out! I want to get healthy for my family and for myself. My husband and I will be trying for baby #2 soon and I want to be at my absolute best for my daughter and any future children I may have. I am starting a health/weight lose competition with my co workers and saw Kami Kilgore on Studio5. I like the concept of changing my life style to always look for a healthier alternative where ever I am. I really want to make some health changes to help me feel better as I go through lifes daily tasks. I have a son coming home from a mission in 5 months. Possible wedding coming up would really like to look my best for the occassion. I LOVE having fun while getting healthy too, Angie. Have you seen that I host a health challenge through me site too. Best of luck and thanks for entering. I’ve just recently started learning about quality blenders. Hoping I get can get one for my wife and I.
I want to really be a good example to my family and start incorporating fresh fruits and veggies and living a healthy active life style. I want to stay healthy for my family and teach my children that it can be easy to have a healthy lifestyle. Being around for my kids and grandkids get’s me motivated to be healthy. I am currently pregnant and anything that makes my life healthier and easier I love! I can make smoothies at all because my blender is really old and awful. It was a wedding present 10 years ago and it is a Hamilton beach from wal-wart. I have been coveting the blendtecs at costco for YEARS! I want to feel good each day and not feel bogged down by all the junk! And I want to feel good as I get older! It gives me energy for the day, so that’s mainly why I want to stay healthy! I want teach my children and those I love about health and fitness through my example. I am motivated to be healthy because I have four kids I need to keep up with! I drink a smoothie every day so I am happy to have some new recipes! I want to get healthy so I am setting a good example for my children. I love, love, love my Blend Tec!! I’m motivated to stay healthy because I believe in living a balanced and full life… being physically fit is a part of that! I love my BlendTec and would love a new updated one. I just found your site and am excited to read more. I am motivated to be healthy because I want to be strong and healthy so I can be the best wife and mother I can be. So I do green smoothies everyday…but I just saw your segment on studio five and it opened my mind up to almond milk, washing my fruits and veggies differently, and putting oatmeal in my smoothie! I totally am trying to find ways to get veggies into our diets,but I never thought of doing a breakfast smoothie with veggies (we do our green smoothies at lunchtime.) This will be fun! I started to loose my energy and had a hard time keeping up with the kids. Getting healthier has helped me be a better mom. I am motivated to get healthy because I want to feel good and look good at the same time. I want to teach my kids healthy eating habits so they can grow up to be healthy and not have to worry about being overweight. Thanks for the great giveaway. As I get older my body doesn’t process food as well as it used to and it’s more important to stay healthy. I love your smoothie recipes. Thank you so much. I love smoothies and am always looking for new recipes. I’m a recent breast cancer survivor, and I’m trying to eat healthier-including a smoothie a day. I would love to get a Blend Tec! What a great post! And you were awesome on Studio 5! Can’t wait to try these recipes. I started Brain Balance for my son who was showing some of the more subtle signs of ADHD and Autism – one of his major issues that we have is his diet. He is an extremely picky eater and smoothies seem like an easy way to get past that. Unfortunately, getting him to drink what I’ve made (even when they taste good) is hit or miss. Also, when I’ve looked at other recipe books and sites it seems like they don’t even LOOK good. Hoping this is a better resource. I’m motivated to stay healthy so I have more energy. Wow a blendtec would be amazing! Thanks for all your hard work and sharing it with us! I don’t know where to start when it comes to smoothies. Your choose one for each step of the way is very helpful! Thanks! I love smoothies and would love a blended! Thanks for all the recipes! I stay motivated to stay healthy because it feels so good and I want to be a good example for my family, friends, and for those I coach and teach. Great giveaway! I stay motivated to be healthy be reading and interacting with other bloggers or people on social media who are going through the same journey! Thanks for the chance to enter. I am just starting a journey to better health. I need all the help I can get! I want my kids to grow up with a love and desire for being healthy and treating their bodies right. I want to feel confident about myself. I love how making healthy choices make you instantly feel a greater confidence, even if it doesn’t move the numbers on the scale. It just feels good!! And of course, I love doing active things with my children and I just have to be there doing things along with them! I am motivated to feel better and stronger! my cousin motivated me because he is older and had the ability to get in shape so i think i can too. I’m committed to becoming healthier because they say it’s never too late. I need to set a better example for my grandchildren, especially one little girl who won’t eat any kind of vegetable OR fruit. I’m always looking for healthier choices. Thanks. I am at my highest weight ever, I hate it and how sluggish I feel, it’s time for a change, already gave up the diet coke, now it’s time to eat better and make a lifestyle change…. I’ve joined the gym and going 5 days working out doing weights and taking a couple of classes. Been trying to drink protein smoothies. I’m just tired of being overweight. Would love to have the right kind of blender. I would love this. They make the best smoothies! I’ve just been diagnosed with Diabetes Type 2. I’d like to fight it as much as possible by changing to a much healthier lifestyle, incorporating eating healthier and gradually working in exercise. I don’t have any grandchildren…yet….but I want to be around for them when I do, and I want to be healthy enough to play with them and enjoy every minute I can! You can do it, Lynn! You can completely turn it around with changing your lifestyle. It’s completely worth it.